One character that we have gotten to know well here in the Virgins is "Barefoot Davis". 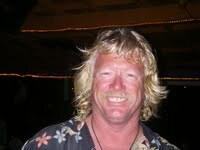 Barefoot Davis Murray, is from Massachusetts but has been in the islands for about 20 years. 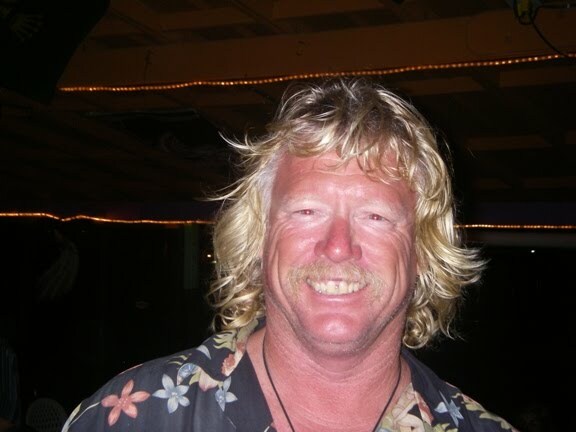 He is well known in the Virgin Islands as the long-standing fleet captain for the Caribbean 1500 Cruising Rally. He's logged over 100,000 ocean miles between the rally and six transatlantic crossings. We first met Davis back in October '06 in Hampton, Virginia when we were getting ready for our offshore leg with the Caribbean 1500 Rally. He's one of those guys that seems to know everything about anything and can fix almost anything. This proved to be quite handy for us a couple of times that Doug needed a hand. Davis volunteers in the rally to help prepare the sailors, some first timers, like us back then, for their first offshore adventure. He is sought after by many in the boating world from commercial vessels to pleasure boats for a number of marine talents (boat builder, rigger, rudder replacer, single side band pro,boat delivery captain, etc) but also because he is one of the only professional commercial compass swingers (intrigued?) in the islands and the U.S.East Coast. He sailed in the Worrel 1000, which is an arduous 1000 mile offshore sailing race from Miami Beach to Virginia aboard a 20' beach cat (yikes!). He can join people in matrimony. Add to this long list, Davis is a real bonafide treasure hunter! One of very few people down island that has the authority from the governments to search land for archaeological treasures (read pirate loot). You can check out his finds at The Pirate's Bight restaurant in The Bight at Norman Island, B.V.I. During the training for the Worrel 1000 Davis picked up a second-hand guitar for $200 and learned two cords, then three cords, and soon a whole song. Davis started writing his own songs and soon his reputation as a musician was known up and down the east coast. "I call my music 'Island Country'," he says. "The lyrics for all of the songs I've written have come from a particular experience, or something that was special to me, or about someone I met". Davis says, "the Caribbean is an atmosphere conducive to music. No propane heaters. No frozen fingers. No TV news. No stateside politics. I'm in my element and I like the comfortable sound of life here." We totally agree! 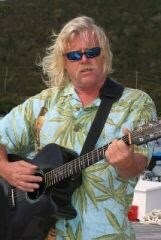 Whenever we are in St.Thomas or close by at Christmas Cove we call "Splinter Beach" on the vhf to see if he can join us for a coldie and some storytelling or to find out where the Barefoot Davis Band is playing next so we can catch the show. If you play an instrument you can join the band as they are always happy to have visiting musicians join them on stage. Davis and the gang play every Monday nite at Latitude 18 in Red Hook on St. Thomas. Last year the band was also playing on the beach at The Elysian (also located in Red Hook) every Sunday afternoon....hopefully he will be there this upcoming season again. Nothing better than sitting in the warm Caribbean sun on the beach listening to great island tunes sipping on a coldie!